- Father Vasily, the first question which comes to mind when one meets you is how you, Pierre Pasquiet, a man of exclusively French origin, became an Orthodox Christian, and not just a layman but a monk and priest, found yourself in Russia, and not simply in Russia but in the ‘back of beyond’, in the small Chuvashia town of Alatyr? How did it happen? - The answer is simple – it was the will of God. When I chose the path of Orthodoxy, when I became a monk, I gave myself to God. Embarking on such an ‘adventure’ has brought me to the backwoods of Russia, to Chuvashia. - Did you become an Orthodox Christian before you first found yourself in Russia or vice versa? - Were you a monk in Jerusalem? - Yes, I was a monk in Jerusalem, near the Holy Sepulcher, where the birthplace of John the Baptist is situated. And St. John the Baptist’s monastery, which is where, according to legend, there is a cave where he spent the first years of his life with his mother, Elisabeth. She died there as well, and her tomb is in the monastery. It is not far from Ein-Karem and the Russian Gornensky nunnery. With her love, Mother Superior Georgia of Gornensky monastery made a huge impact on my decision. I talked to her nearly every week. Saturday night I stood there, prayed with them and cried because I couldn’t take Communion with them. And I had to wait for that moment for 15 years. Then I met Metropolitan Varnava, Archimandrite Gury and father Hermogen, and those meetings impacted on my decision a lot. When I heard their heartfelt words and felt their support I didn’t doubt any more that I had to make up my mind. I did it in 1993, when I left the Greek Catholic monastery and came back to my motherland. Then I wrote my first letter to Patriarch Alexy. - And where is your motherland? France, the town of Chole. It is a small town in the west of France, where I was born, and my family originates from Vandee. It is a famous French region, which was well known for its royalist spirits and opposed the Revolution. - So how did you find yourself in Moscow? - When I was waiting for an answer, I had a phone call from Moscow, they spoke in French, but with an accent, and asked me whether I was really going to come to Moscow and embrace Orthodoxy. It was unexpected for me, but of course I said that yes, it was true and asked them to help me with an invitation, because without one I couldn’t get a visa. The people who called me belonged to the Sretensky parish. I didn’t know much about them- it was, as they called them here, an ‘experimental’ congregation. Then I got the invitation and arrived here. I was met by Father Georgy, who of course welcomed me nicely, but I felt uneasy in my heart, I felt that it was not exactly what I was expecting. They suggested I would take part in Communion… At the service the next day I realized it was not what I had sought. They say it was some kind of movement, renovation of sorts…but I have no right to judge them, I just felt out of my element there. And the relatives of my friends who lived here and who I had previously met in Jerusalem, understood the difficulty of my situation and tried to help me to find a different parish. - So I found myself at Father Alexander Shergunov’s parish. I felt comfortable with Father Alexander, especially since he speaks French, which for me was of great relief at that time when I couldn’t speak Russian at all. Father Alexander immediately directed me to Bishop Arsiny, to the Patriarchy, and I wrote my second petition there. The answer arrived at the beginning of March 1994, when Lent started. So during the first week of Lent, on Tuesday, I was invited to St. Daniel monastery, where through the special ceremony I became a Russian Orthodox Christian. The next day there was the Liturgy of Presanctified Gifts and I took Communion. Of course it was unforgettable and great comfort to me because I had felt I was a fully Orthodox Christian for such a long time. The second Eucharist was on Friday, and on Saturday I was invited to serve with the Patriarch in St. Daniel monastery. It just was St. Daniel day and it was great honour for me – to serve with the Patriarch. - Were you a Deacon? - Yes, I was ordained Deacon. I was allowed to say litanies in French, which was a relief, because I couldn’t speak Church Slavonic or even Russian back then. After the Liturgy I was at dinner with Patriarch and all of the monks. And I could feel I was completely an Orthodox Christian, not only in my thoughts or in my heart, but absolutely. Then I was sent to Pskovo-Pechersky monastery. Before that I had met Father Tikhon (Shevkunov), just by chance : Father George was passing the Sretensky church to the new monastery, which then worked as representative of the Pskovsko-Pechersky monastery. Father Tikhon and I had a wonderful meeting. We liked each other at once and this good love for each other still works. Later we met again in the Pskovo-Pechersky monastery, and by the blessing of Father Archmadrite Ioann Krestiankin, I was anointed. It was a modest ceremony, in the Uspensky church. And Father Tikhon, since he was present, became my Godfather. And he is really my brother in spirit. - How long did you stay at the Pskovo-Pechersky monastery? - Not very long. I arrived there in April, at the end of Lent, and stayed till the end of June. Then there was a break because my visa had expired. The authorities in Pskov didn’t know what to do with me, and I was directed to Moscow. 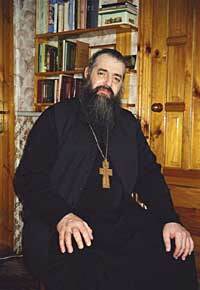 There I met Archmadrite Jeronim (now he is the abbot of the St. Trinity monastery), then he still was a regular priest. He just returned from the Holy Land. We met on St. John the Baptist’s Day and decided to go to Athos. It was my lifelong dream. So, blessed by Patriarch Alexy we went to Athos for two weeks. As soon as I was back I wrote a petition to the Patriarch asking him to send me to Chuvashia, to Bishop Varnava’s diocese, who now is a Metropolitan. - Father Vasily, I have heard a story about you painting something while living in Pskovo-Pechersky monastery when a French delegation arrived…Could you tell us about it? - Well, yes, it did happen, they were military, paratroopers. I wasn’t painting, I was plastering Elder Simeon’s(now a canonised Saint) cells. I can plaster a little, though I think a monk must be ready to learn any manual work. Once I had learned to plaster, and so they asked me to do it. But I couldn’t find a common language with the monastery caretaker, and he even called me a sheep. 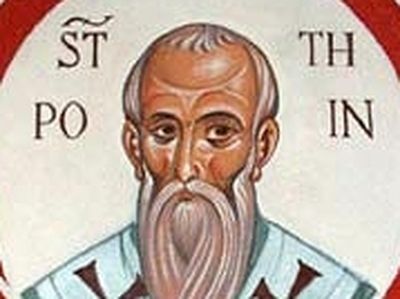 I was hurt at first, but then accepted it with humility, thinking that a monk should not get offended, but must be patient for the sake of God, for the sake of Christ. - And what about the French delegation? - Naturally they were surprised to see me there, especially since it was 1994, it was not clear where Russia was going, too much confusion and temptation. And what a Frenchman would do in Russia, was not clear to anyone, not even to myself. - Did they immediately find out that you were French? - Well, yes, I welcomed them and it became clear. Especially since one of my younger brothers was an Army Officer as well (he is a Colonel now) and we had things to discuss together. Their group was located in the same place where my brother was, so they knew each other. - And how did Chuvashia welcome you? 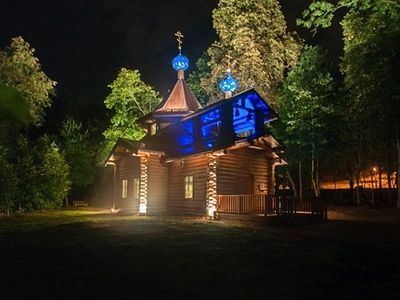 - In Chuvashia the Bishop met me with great love and great attention. I found my comforter in him at once. Varnava – means ‘the son of Comfort’. The Bishop is sort of my highest spiritual father and teacher. When I look at him I know where to go, what to do. - But you found yourself virtually in this, one might say, hole…. - - Well, it does a monk good. - It is all good for a monk. Of course, there were moments when I thought about going away and asked God directly: What do You want from me? Why do You put me in these conditions? And the conditions I was in at first were horrible: rats, a leaking roof, a bed with dirty sheets where before me possibly some drunk had slept, everything wet – on the whole, horrendous. And after my Jerusalem life of course it was difficult and hurtful for me. I really cried and asked God: ‘Why, what do You want from me? What do I need this for? Now I understand what I needed it for. There is a parable: The Lord invites everyone on to the mountain of Tabor, to witness Transfiguration. You can get on a bus which would take you there free of charge. But you will sit really far from the Lord. But then there is a special ticket, which you pay for, and then have to walk up that high mountain and have to pay every hundred meters to be allowed to go further. I think a Christian life is the same, if you want fullness in your life. If you want to be close, you have to pay for it. - So how did you pay? - I paid, experiencing humility, humiliation, and so on. A monk should live like that. If a monk has everything, has comfort, he needs to think whether he might be lost on his way. If a monk’s life is a bit tough, then probably he is on the right path. - You have been in Chuvashia for eight or nine years? - They say, somebody like the French Minister of Foreign Affairs visited you? - Huber Colin de Verdiere? - So how did you like it there? - It was fine. Of course he was surprised to see the monastery in such a poor state. It was a building site. The monastery premises were destroyed under Soviet ownership. He saw how much we had done in a short time and how much was left. But he could see what Faith is, what miracles are. Later he thanked us for inviting him to spend the night at the monastery, because staying there and eating with the brothers was a special event for him. Of course all the local and regional dignitaries were present as well. - Was all the grass painted green? - Of course. (Laughs). It was a good meeting. Then we saw him to the border with Mordovia. - We know that France takes great care in its citizens and aspires to spread its culture. Apparently the fact that you were a French citizen brought on the Ambassador’s visit? - Yes, France really takes care in its citizens through its embassies and consulates. They also want other nations to learn French and help schools and other organizations. But he did it, apart from other reasons, out of spiritual curiosity – he wanted to see the monastery from within. - Yes, he was here, but not visiting me personally. It was his first visit of Chuvashia. The first time he was there was in 1996, but then he visited only the capital, Cheboksary. And in 2001 he went to several towns, including our Alatyr. Of course it was a great honour for the city, for every Orthodox Christian. Thousands of people gathered to meet him, even His Holiness himself was surprised. His visit gave us an impulse which still lasts. We would be happy to meet him again. - Yes, you know, I really revere Bishop Varnava, he is a saint man. And to blame him in such a sin is really wrong. These rumours are really hurtful for us, the clerics of the diocese of Chuvashia, because we all love our bishop, he is like a father for us. - One priest has simply found a pretext (he has been looking for it for a long time) to insult the Bishop. He simply hates him, I don’t know why. And the pretext he found was the Bishop’s presence at the blessing of a monument, dedicated to our mothers. Why wouldn’t there a monument in honour of our mothers, who brought us up, who worried and suffered for us? This monument is a cultural object, has nothing to do with religion. 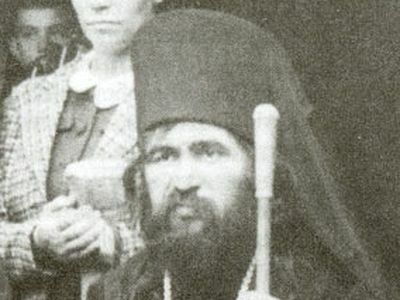 Father Andrei Berman is deeply mistaken in this case, and that is because here he fights not for the purity of the Christian Orthodoxy, but for his pride and disobedience. In my opinion, he is an idolater of his pride. This is my own opinion. - Are there any more foreigners in your parish? - Yes, an Englishwoman, Orthodox Christian as well. She works at school as a teacher of English. - Did she move specifically to Chuvashia? - About eight or nine years ago she was invited to Cheboksary specifically, but then she met me through some friends and came to Alatyr because she was looking for a spiritual father. She speaks French, so it is easier for her to confess and consult with me. Of course she speaks Russian perfectly too, better, than I do, because she studied it at university. I didn’t study Russian – just soaked it up, like a sponge. - How do you find a common language with your parishioners, they are mainly elderly country women? - It is really easy. As they say in Russian : the parish is like the priest.? If ‘grannies’ can see that their priest is a fervent believer, even the language becomes superfluous, they look in your eyes, and follow you. If a priest loves Christ, then even if he is poor and not very literate, they will follow him. That is why it is easy. Of course, I am not saying that I am exactly that kind of priest, but I do love Christ, and I have given my life to Him, and probably people can feel it. - Well I should say that the Church Slavonic language was easier for me than Russian. - I don’t know why, but I can read in Church Slavonic without problems, and I have difficulties dealing with Russian. I understand the Gospels perfectly, even Tipikon. Of course, sometimes there are difficulties, but I can understand the service and the Gospels perfectly. I’d advise those people, those who don’t understand, to work a little, to be patient, and pray – and they will understand. I didn’t speak Russian, but I was thrown into the village where people spoke only Russian and I started to understand gradually. And if these people go to Church, pray, and listen soon they will know the Church Slavonic language. But the young people of our time are too lazy and don’t want to work, to study. - Are they lazy here or in France? - The same. It is a contemporary decease of our young people. It is okay for them to sit by the TV or computer, thinking about nothing, the computer will do everything – will write and think. A modern man is a kind of disabled in terms of real life and history. - Father Vasily, you were in France last year, after a long break, how did you find it? - Of course I was happy because one’s motherland is one’s motherland. I could see that everything is so wonderful and beautiful, and so tidy and trim there. Neat, beautiful. But you know, the last week of my stay there I felt nostalgic, missed my poor Chuvashia and my parishioners who are my brothers and sisters. Both Russia and Chuvashia are my motherland now, because I was born anew there. 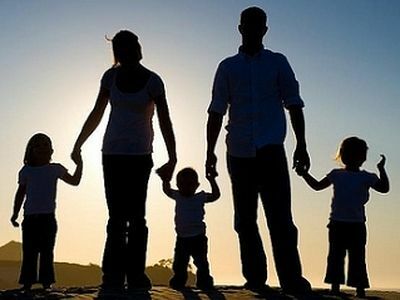 As the Lord said : Who left his family or fatherland for the sake of Christ, will find a new family and motherland. - How did they receive you in France, when you arrived there as an Orthodox priest? - It was fine. You know, the church-ward of our parish, said “Our Father Vasily, he is like a banana, there is something exotic about him”. And I do feel that way, that I am a little exotic – I could feel it when I arrived to live in Russia, and now I can feel it when I visit France as well. - And how did your relatives and family meet you? - It was fine. Of course, they worried about me, my decision was unexpected for them. - Are they Roman Catholics? - They are Catholics. Of course, my father was very upset, and was against it, but he has brought us up in freedom, and in the freedom of conscience as well. So he kept his worries to himself. I think that now that nine years have passed he is reconciled to it, even if he cannot understand why I left Roman Catholicism and became an Orthodox Christian. Maybe he cannot understand why, but he can see that it is the will of God. - And what about your brother? - It is the same with him. My younger brother is even thinking about becoming an Orthodox Christian. He has not made up his mind yet because he has children and one of his daughters is a lay-sister in a Catholic monastery so the step would not be easy for him. He doesn’t want to split the family. I told him to wait, not to hurry, I had been living as an Orthodox Christian for fifteen years, though officially I wasn’t an Orthodox. The most important thing is to live like an Orthodox. To be one not on paper, but in real life. 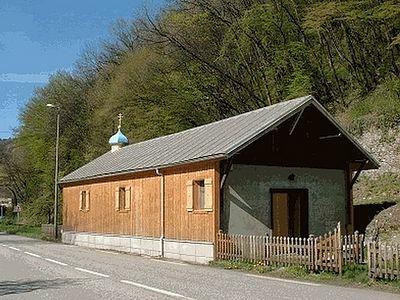 - But in France, Father Vasily, there are many shrines which are revered by the Orthodox as well. - Some people say that Orthodoxy becomes more popular in France. Is it true? - Yes. Yes, it is true, and we are happy about it. We could say that France is going back to her first love. Though the number of Orthodox parishes is still not high, about 200. - This hasn’t been so for a long time. You would sooner speak of France as a Muslim country because Catholics have stopped being Christians. They are secular. ‘Catholic’ is just a name. Churches are shutting down everywhere. One priest serves in 20-30 parishes. There is a terrible lack of priests. There could be no clerics at all in the near future. It is a crisis, a real crisis. - What about young people, do they go to Church? - No, they don’t want to. And the number of people who are practising Catholics is really low. Of course, most people are nominally Catholics but more people attend mosques than Roman Catholic churches. That is why Orthodoxy grows, because many people are seeking the Truth, want a real Christian life, and they can find it in Orthodoxy. I think Orthodoxy is going to have a big influence in France quite soon. Even now Orthodoxy has authority. You could see it through mass media, TV, radio. Catholics even use Orthodox theology to explain the meaning of various Church holidays. - Why did you say France is going back to her first Faith? Many people here think France was always Roman Catholic. - No, France was Orthodox Christian until the 12th century, before the schism between the Western and Eastern Churches. But even that schism of 1054 was the split between Rome and Constantinople, and didn’t affect the rest. 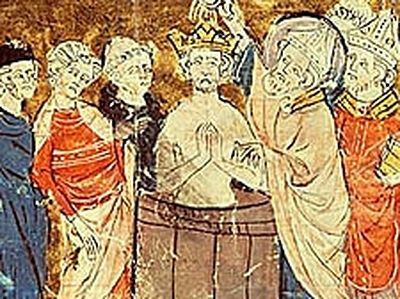 Up to the 12th century France was deeply Orthodox both in its Liturgy and Theology. And the echo of that Orthodoxy(in my opinion) was heard even in the 19th century, when a new dogma on the papal infallibility was brought about. The French Church strongly opposed its introduction. But nowadays, of course, all French clerics think that the Pope cannot sin when he is in the pulpit. - Thus you can say you turned back to the faith of your ancestors? - Yes, yes, it is truly so.